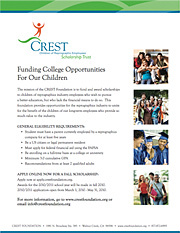 Applications can be found online at apply.crestfoundation.org. To prepare, students may begin now by applying for FAFSA if they haven't already. For information on FAFSA, please point your browser here. Two personal recommendations will also be required as part of the application process. Recommendations can come from high school teachers, employers, family friends and others outside of the student's immediate family. Students should confirm their reference's willingness to fill out the recommendation form by the application deadline and obtain their email address for the online scholarship application. Students will need to prepare a personal essay for the CREST Scholarship application. Students may write this in MS Word and copy/paste to the online application or type directly into the application forma online. Essays must be 500 words or less and include information that they believe the committee should know as they consider their application. Future educational and career goals must be included. Students may include academic or personal achievements, leadership skills and experience, community and school participation, and financial obligations.